With ABAP in Eclipse it is very easy to format the source code of ABAP objects. Pressing Shift + F1 before saving or activating a development object gets your written source code in a pretty format. But even though it is not a lot of work pressing two buttons before each saving or activation step I think to a certain degree this repetitive task should be automated. I do not worry about the time needed for this manual tasks but more about the situations where the unsteady source code formatting obfuscates the build-in version database or the abapGit history. Pretty printer is cool, so why not perform it automatically? Therefore I added a functionality to ABAP in Eclipse to enable automatic source code formatting of ABAP objects (currently classes, function modules and CDS views are supported). The feature is part of the free abapCI Plugin. In the Eclipse preferences there is the possibility to configure and even remove this mandatory comment. But I think this could lead to unwanted formatted development objects (eg. 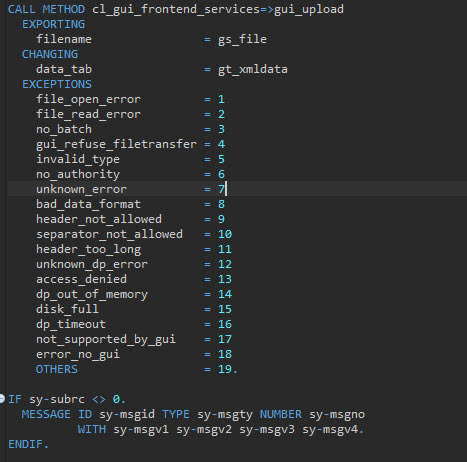 generated data provider classes, legacy source code items with a non SAP conform style,…). Thus I decided to take the defensive path by introducing the mandatory comment … at least for the first release. 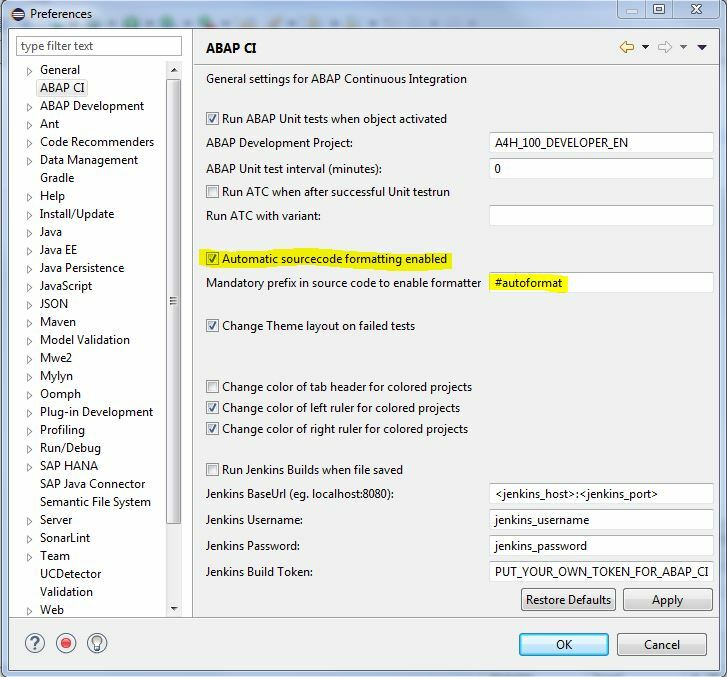 To get the automatic ABAP source code formatting feature up and running three steps are necessary. 1. 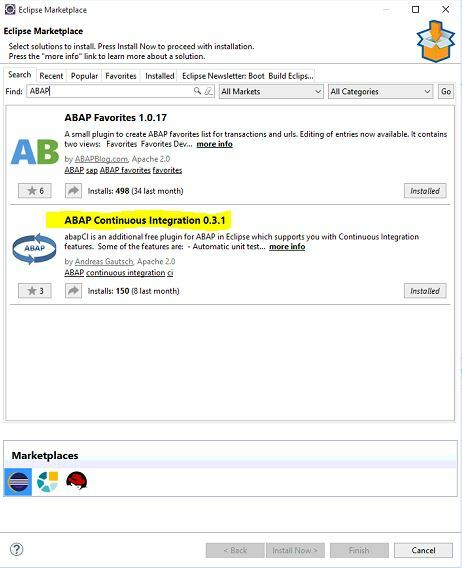 Installing the abapCi Plugin from the Eclipse Marketplace, if not already done. Starting from this point it is ensured that on each save or activation of the development object the source code formatting is automatically performed. Hope that helps to save at least some keystrokes or even better to clear up your abapGit or transport history. Great contribution! Is this on GitHub? A virtual beer goes to you ;). And dear SAP, please port this option to the good, old SAP GUI. I installed the plug-in, but i get an error. Eclipse Oxygen 3a. Hi Marcel. The eclipse version seems to be ok. Have you installed the latest ADT? But lets take a closer look next week on the details of the errormessage. This week I am on vacancies without access to my personal computer. I made a new version today – 0.3.4, can you please update on this. 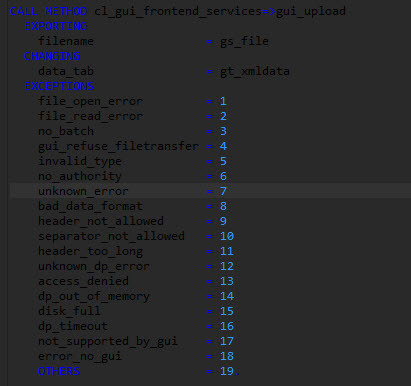 If this does not solve your issue please post the stack trace of the error (should be in the error log or in the details) then I take a deeper look into this strange behaviour. Thank you for sharing. I tried but the tool will affect the colors of coding. I am currently using Dark theme. Uninstall of the tool will solve the issue. Yes, with the dark theme the color changes are not full supported. If you deactivate the following two checkboxes everything else should work like expected. Neither of the two are related to the automatic source code formatting. Thanks for the information. I will have a try.